The locking tabs are designed to withstand up to 180# psi. 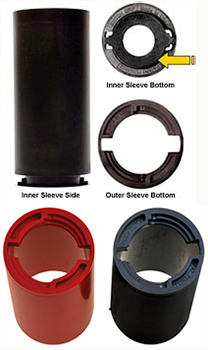 While they are certainly built to perform, like most consumable and movable products, the Inner and Outer Sleeve locking mechanisms will wear over time. There are many variables that influence how the product will wear including grip pressure, # of games bowled, # of times insert is being removed/interchanged, proper use and storage, drilling etc. Please be sure to visit your retail professional for a fit inspection periodically to ensure best results and performance.